Nezumi, Jack the Mouse is a Japanese urban legend. His passion for money drives a cynical, duplicitous coffin maker to take on Nezumi’s mantle. In this kaleidoscope of disguise and deception, society’s pretenses are destroyed in a melting pot of farce, social satire and courtroom drama. The mighty are brought low to everyone’s delight. 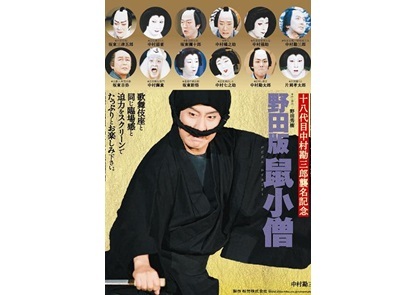 Contemporary theatre genius Hideki Noda collaborates with Kabuki theatre at the invitation of celebrated actor Kanzaburo.